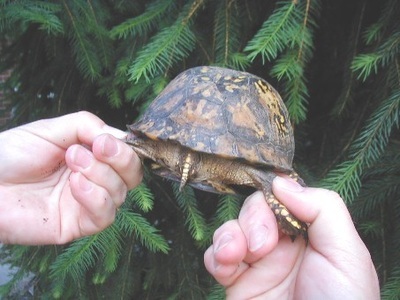 Breeding box turtles in captivity is not difficult as long as you have healthy turtles and a proper environment. hormones are produced and reproductive organs go through changes. 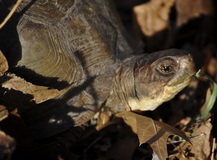 and females separate until they are eating well and are active. have a flatness to theirs. 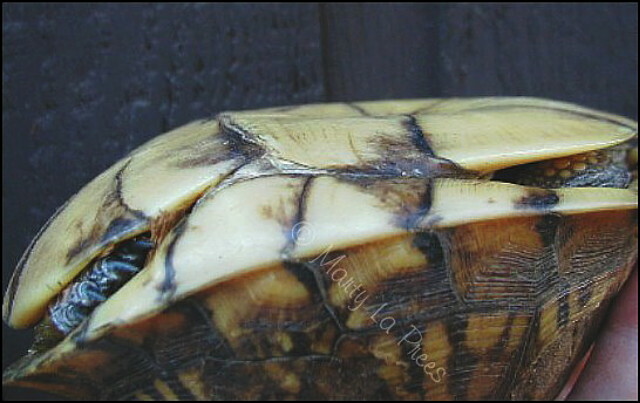 This concavity aids the males in mounting the females during breeding. 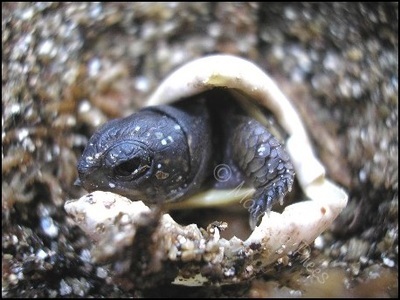 The flat or sometimes convex plastron of the female allows for slightly larger body cavity for developing eggs. 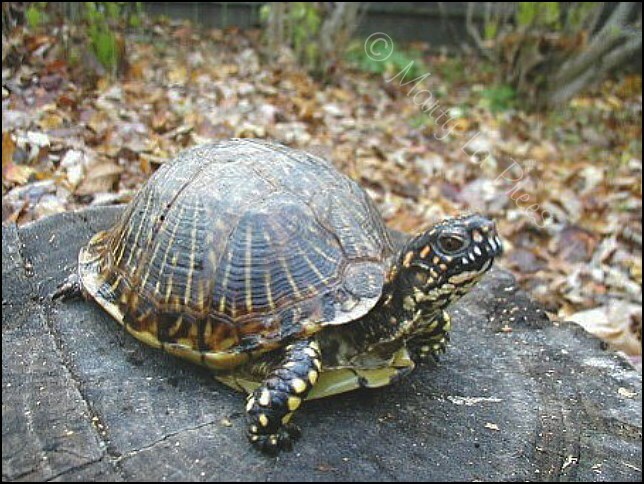 compared to the females thinner tail with the cloaca closer to the shell. 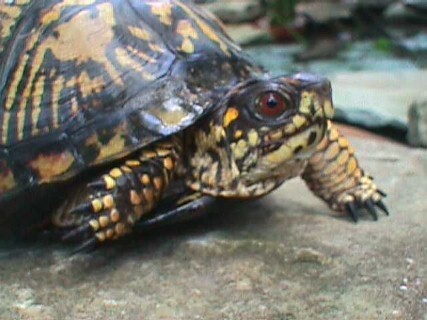 It is also said that males have red eyes. That is true, but I also have seen red-eyed females. Most females have brown eyes. 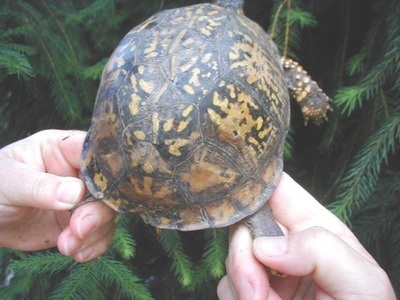 Below are photos to show the difference of a male and female box turtle. The plastron of a female is flat and the cloaca of the female box turtle is closer to the marginal scutes. 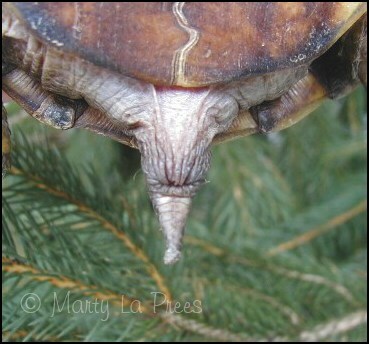 Notice the concavity of a male turtle's plastron. 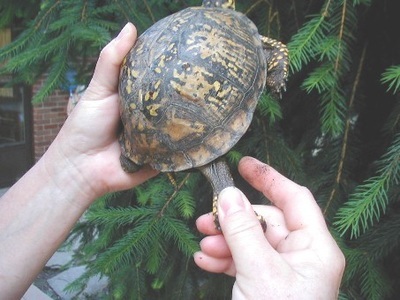 The cloaca of the male box turtle is closer to the tip of his tail. 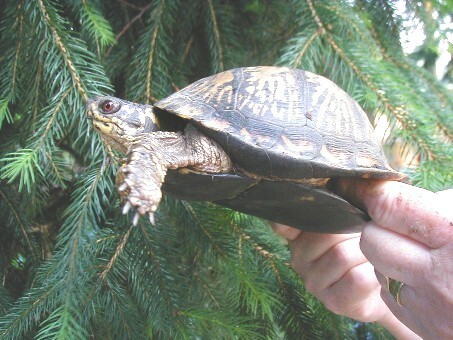 Often times, people believe that the male box turtles are the ones with the red eyes. 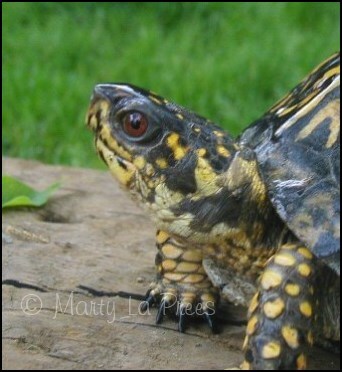 While typically females have brown eyes, I have discovered that some females also have red eyes. It is important to not mix subspecies of box turtles in order to prevent mixed subspecies hatchlings. 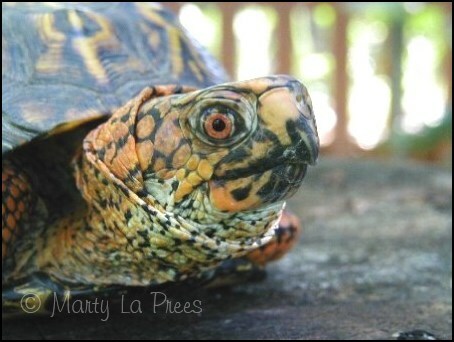 alarming when a box turtle owner observes this for the first time. 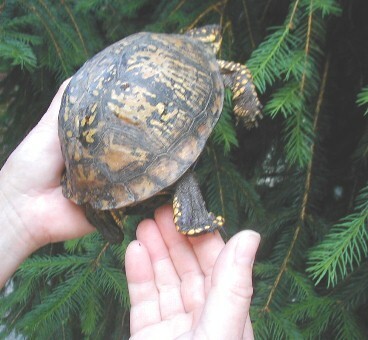 This female Eastern Box turtle will be laying her eggs soon. 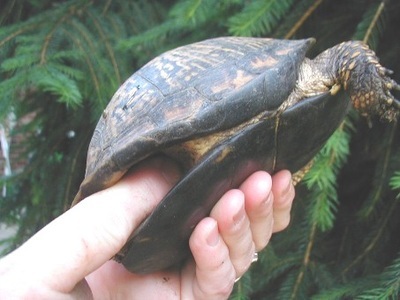 There are several ways I determine if any of my females are gravid. I weigh them regularly and note when there is a gain in weight. for eggs. Placing your cursor over each picture, will give you a description. in any danger. 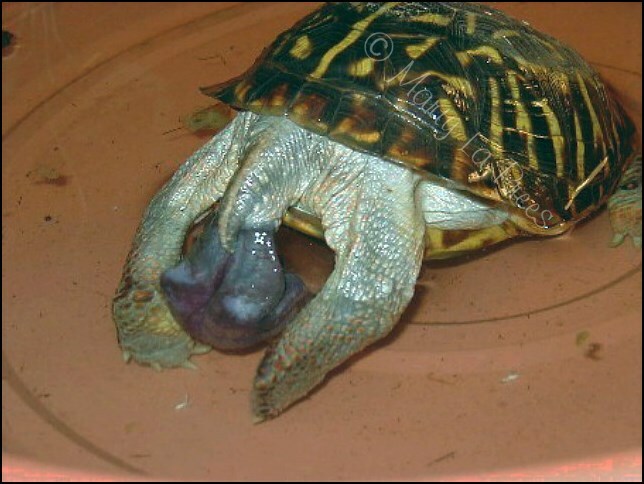 This can be used on other species of turtles and tortoises. After extending a back leg, it is held outside the shell edge. I then insert my finger in front of the leg in the soft tissue area. I insert my finger as far in as possible. At this point, you may be able to feel eggs. Palpation is continued on the opposite side. 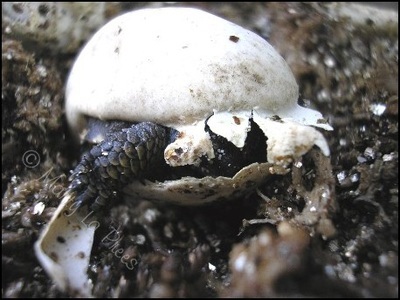 Pushing carefully, I feel for eggs, sometimes tilting the turtle to allow any eggs to move to one side. 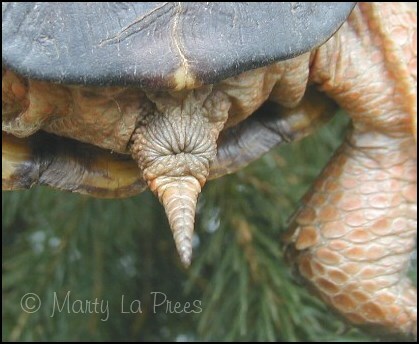 Here is a side view of palpating for eggs. the walls very dense and compact. to even locate the nest. eggs in the water. 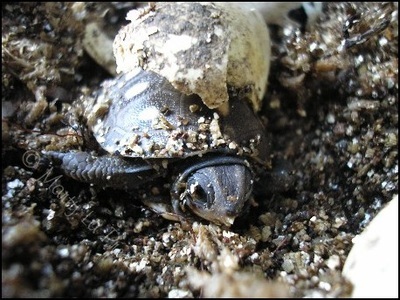 Usually, these are not fertile, but if you can remove them, it is worth trying to incubating them. time consuming process because the dirt is packed very tight. 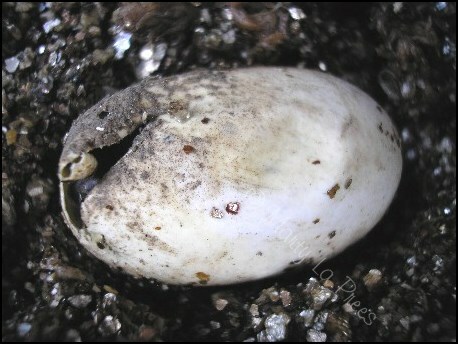 When removing eggs, do not jostle or rotate them. moss is placed over the top of the eggs and a lid is loosely placed on the top. Humidity is very important for incubation. alarmed if some of the eggs sink in. This happens in clutches. It does not necessarily mean that they are not fertile. but again, it depends on humidity and temperatures. process by cracking the shell. You can imagine how tired this little one will be by the time it is completely out of the shell. where information is available to compare proper growth rate. 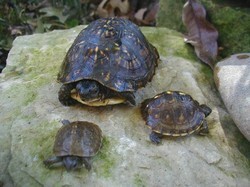 This photo shows a 6 month old, a one year old and a 2 year old box turtle.